The U.S. Mail: Not for Sale!! September 17, 2018 — APWU: Privatizers – those who want to sell the public postal service to private corporations – are hard at work. Together we can stop them in their tracks. 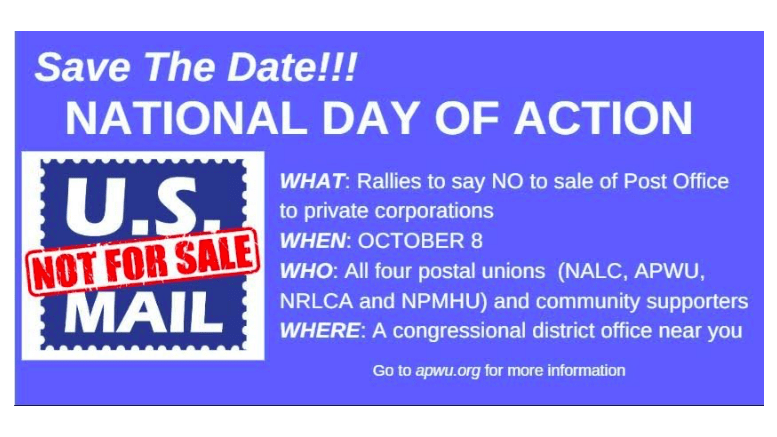 NRLCA: The NRLCA, along with the other three postal unions, have scheduled a rally against postal privatization for Monday, October 8, 2018. The rallies will be held in each congressional district throughout the country at specific locations, and NRLCA members are encouraged to participate. More information about the location of the rallies will be available shortly. Please continue to check the NRLCA website as additional details become available. The postal service is currently a total “charlie foxtrot” Maybe the unions need to start to make management answer to their mistakes – enforce the contract since management feels they do not have to adhere to the rules of agreement. Only then maybe the postal service can start to straighten out. Right now management is not being held accountable for their actions. It appears they screw up, they move up – only making matters worst. I am a carrier and until that happens, let’s privatize the post office.